How we tell stories with video has changed dramatically in the last 15 years. If we take videos as a consumer market, the viewers are the consumers, suppliers being the video creators and filmmakers, and the distributors are the platforms (i.e Facebook, YouTube, Cable television). We observe that the internet has fundamentally changed the dynamics for everyone involved. In pre-internet times, controlling distribution meant owning the market. If you wanted to create quality video content and make a living out of it, you would have to tie up with a distributor of video content such as HBO. Such distribution channels were always skewed, meaning there were always disproportionately more consumers/viewers than there were suppliers/creators. The suppliers/creators were dependant on the distributor for resources — air time, production resources etc. The distributors profited by owning exclusive relationships with the creators. The internet toppled this arrangement completely. Distribution cost on the internet is zero — the distributors can reach people at relatively marginal costs. The transaction cost between distributors and creators is also zero. You don’t have to pay/forego a cut to YouTube, Facebook or Instagram to start creating great content. This has meant that the distributors can now instead focus on the viewers. This way the distributor or platform that gives the best experience to the user wins. Thus, while controlling the relationship with suppliers was most important for distributors in pre-internet era, now its more important for the distributor to give the best experience to the viewer. 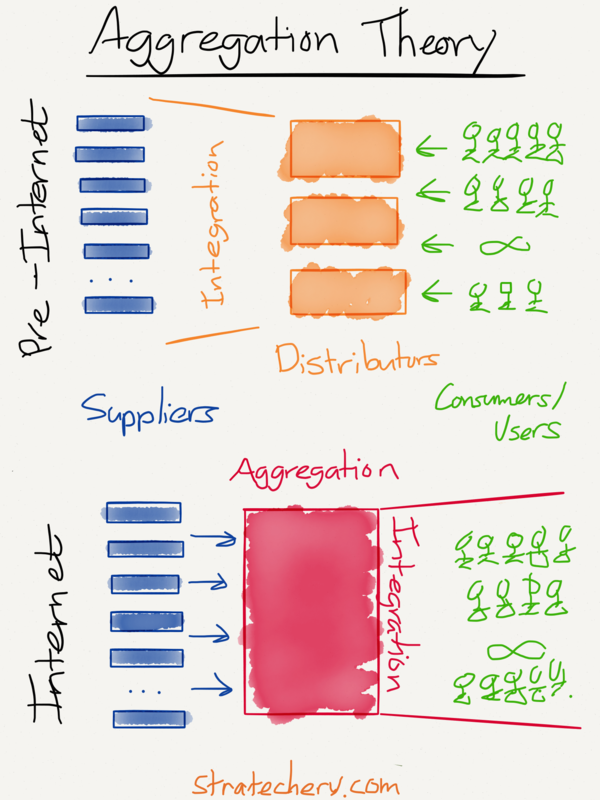 You can read and understand how the internet has revolutionised distribution and created some of our most beloved products in Ben Thompson’s Aggregation Theory. YouTube — When YouTube was founded in 2005, the internet had not seen anything like it — anybody could become a creator, a filmmaker without spending a penny. This created a huge surge in filmmakers who were now creating content on the little and big things they are passionate about and figuring out new ways to tell stories in the internet era. iPhone — The creator no longer needed a crew, an expensive camera or equipment. They could point and shoot with a little device that they carried around in their pocket. If platforms like YouTube and Facebook were the software, the iPhone was the hardware that democratised video creation. Modern historians would probably look back at our times as the age when the Cinema Verite movement exploded. People were no longer only interested in million dollar tales spun by Hollywood, they wanted something more ephemeral and in the moment — videos from the lives of real people and real people sharing their passion, not “experts” with vested interests at stake. This is what has made the likes of Casey Neistat and Shaytards some of the most important filmmakers of our times. Distribution: YouTube has grown to become the world’s second largest search engine, establishing itself as an undisputed leader in video distribution. Disney’s acquisition of Maker Studios (the multi channel network that manages YouTube channels such as Epic Rap Battle) for $500 million shows how dynamics have changed. While most of Disney’s big acquisitions in recent years have focussed on intellectual property rights, the Maker Studios acquisition was not for intellectual property but for the 380 million subscribers that they reach through various YouTube channels. Content creators and platforms that can capture the attention of people win. It is the aggregation theory at work. CNN’s $25 million acquisition/acquihire of Casey Neistat founded app Beme is yet another indicator of traditional, big players vying for attention of a generation that was born “internet first”. Nobody has really figured out mobile video. While Snapchat’s big IPO and rise of similar “camera first” apps in Asia, such as Snow shows the value mobile holds, user retention has proven to be a problem. Snapchat registered a stagnancy in user growth in the last quarter before its IPO. If you have any doubts about the value that mobile holds and the battle that lies ahead, look no further than Facebook’s tragically comic attempt at trying to become Snapchat. Creation: There is no shortage of platforms for creators to express themselves, and there is no shortage of cool new hardware. Snap Inc’s spectacles is an exciting product that will take the Cinema Verite movement forward — More raw moments from unique vantage points (I’d rather not term it reality tv, cause it just seems to have a negativity about it). Snap inc. and Pokemon Go to an extent has proved that the mobile camera is a hugely untapped platform. It would be interesting to see if something non-ephemeral will come out of Snapchat or other camera first apps vying for valuable attention of people. Apple’s huge investment in augmented reality would also very likely play out in some way or the other in camera first apps. Distribution: Monetisation is broken. Annoying ads kill the user experience of a user and in an age where the experience and attention of the user is valued the most, that is not a good thing. This is where Bitcoin and the underlying blockchain holds a lot of promise. At the moment, distributors like Netflix and YouTube Red have to charge a fixed subscription irrespective of the number of shows you watch. With Bitcoin enabled micro-payments, viewers can be charged only for the content that they watch, or be refunded if they watched only 10 mins of a two hour movie. Bitcoin can also be used by fans to transfer money to creators. Imagine a QR code at the end of the video of your favourite YouTuber, scan it and you can pay him in Bitcoin, from any part of the world. Creation:What is rather disappointing in video creation is that, there has not been a major shift in terms of software that online first filmmakers use to make their videos. Video editors such as iMovie make incremental improvements, but there is no software out there that makes editing simple and accessible for a new age creator. Imagine an editor that lets you add cool motion graphics to your videos and then makes it mobile friendly, Facebook or Snapchat optimised, and even cuts small intelligent trailers for you to publish to your fans. There is a lot left to happen in this space, which is what we at Typito are really excited about. Its been close to 140 years since photographer Eadweard Muybridge used high-speed stop-motion photography to capture a horse’s motion and sparked the beginning of film and motion pictures as we know it. The path we are on sometimes reminds me of “Infinite Jest” from David Foster Wallace’s encyclopaedic novel. Infinite Jest, also referred to in the novel as “the Entertainment”: The film, so entertaining to its viewers that they lose all interest in anything other than viewing it and thus eventually die. It truly is the best of times and the worst of times.